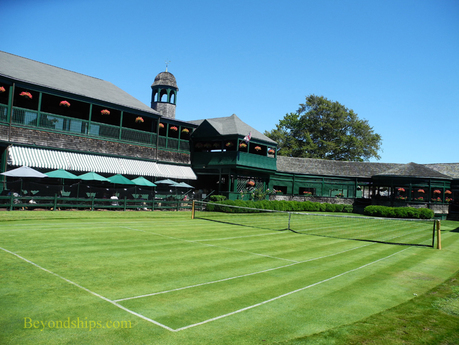 Newport is sometimes called the cradle of American tennis. In fact, the first American lawn tennis championships were held in Newport. That tournament, which subsequently became the U.S. Open, was played each year in Newport until 1915. 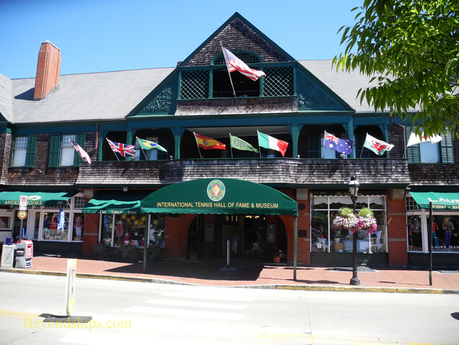 Consistent with this heritage, Newport is the home of the International Tennis Hall of Fame and Museum. It is recognized as the official tennis hall of fame by the International Tennis Federation. The museum chronicles the history of tennis from the 12th century to the present time. The building housing the Hall of Fame and Museum is of both architectural and historical significance. Located on Bellevue Avenue, it is only a short distance from the Newport mansions and is linked to the affluent Newport society who lived there. The story goes that James Gordon Bennett, publisher of the New York Herald, challenged his friend Captain Henry Candy, late of the Queens 9th Royal Lancers, to ride his polo pony into the Newport Reading Room, a prestigious gentleman's club. Candy did so and was promptly banned from the club. Outraged by this retaliation, Bennett decided to build his own club and commissioned the prestigious firm of McKim, Mead and White to design the building. 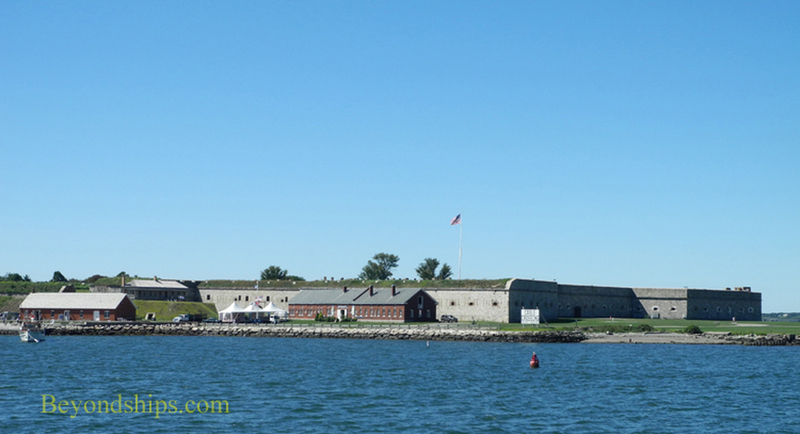 One of the first things that cruise ship passengers see when their ship drops anchor off Newport is Fort Adams. This low-lying stone and masonry complex is the largest coastal defense fortification in the United States. times, the fortress that you see today dates from 1824. It remained in active use until the 1950s. While it played a role in five major conflicts, the fort was never called upon to fire a shot in anger. Today, Fort Adams is a Rhode Island state park. Visitors can tour the fortress and explore its defenses and tunnel system. The park is also used for swimming, fishing, boating, soccer, rugby, and picnicking. The Newport Jazz Festival and the Newport Folk Festival are held on its grounds. Not far from the tender pier in the 1762 Brick Market building, a National Historic Landmark, is the Museum of Newport History. Operated by the Newport Historical Society, the focus of the museum is, of course, the history of Newport and its architecture. 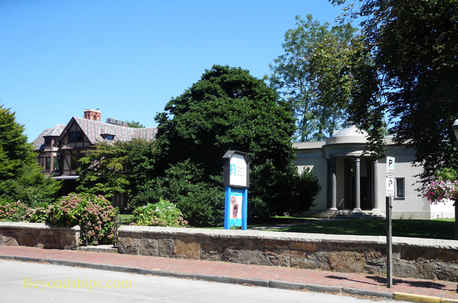 The Newport Art Museum is a 100 year old organization that includes both galleries and an art school. Its permanent collection focuses on the visual art of Newport and southern New England. Located on Bellevue Avenue, one of its buildings is the John N.A. Griswold House, a mansion designed by Richard Morris Hunt who would later design The Breakers and other Newport cottages. Founded in 1884, the War College is a graduate level institution attended by senior officers and those likely to become senior officers, not just in the Navy and Marine Corps, but the other branches of the armed services as well. There is also a program for officers from other countries. The objective is to prepare leaders on both an operational and strategic level. Graduates can earn a masters degree in National Security and Strategic Studies. Visitors cannot drop by and participate in a war game or audit a course. 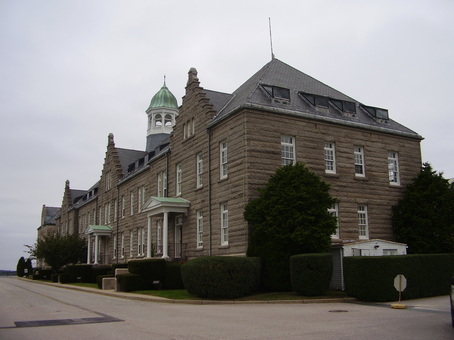 However, the public can visit the Naval War College Museum, which is housed in the College's original building. 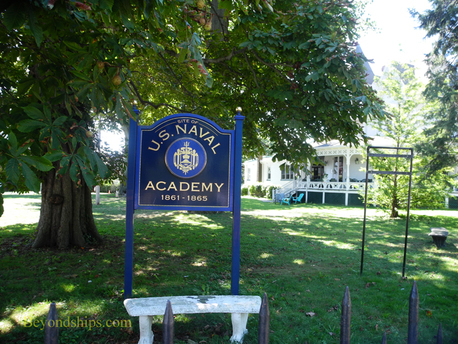 The museum focuses on the history of the War College and on the history of the Navy in the Newport area. Visitors must make reservations in advance to visit. 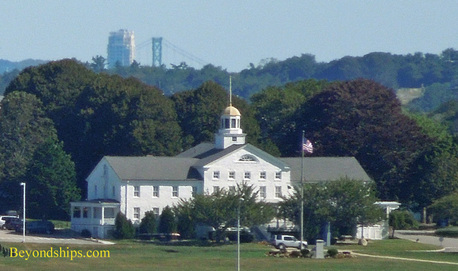 Above left: The Naval War College Museum is in a building that was once the Newport poorhouse. Above right: Luce Hall is still used as part of the Naval War College. Running along Newport's eastern shore is a National Recreation Trail, the Cliff Walk. It extends for some 3.5 miles. Much of this is over paved or well-used trail. However, some of it at the southern end is over natural rocky coast. The Cliff Commission warns visitors of the risk of traversing these slippery areas as well as of the danger of the cliffs which border the trail and of poison ivy. http://www.cliffwalk.com/ Thus, while the Cliff Walk is popular with locals and visitors, it is use at your own risk. The trail offers scenic views views of the coast. In addition, because it is a public right of way, it passes in back of many of the Newport mansions, giving a glimpse of some of the houses and their grounds. Not far from where the cruise ship tenders dock is one of the oldest baseball stadiums in the United States. It is believed to date at least since 1908 but may well be older. It was renovated and expanded by the Works Progress Administration during the Great Depression. 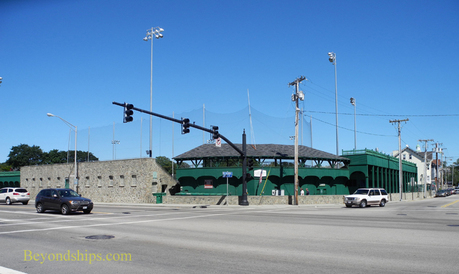 Baseball greats such as Satchel Page, Yogi Berra, Phil Rizzuto and Bob Feller played here. The stadium is still used for local and college games. Then Senator John F. Kennedy married Jacqueline Bouvier at Saint Mary's Church in 1953. Saint Mary's belongs to the first Roman Catholic parish to be established in Rhode Island (1828). The church itself was built in 1852 . Newport has been called "the capital of sailing" and on a summer's day the harbor is a forest of sailboat masts. 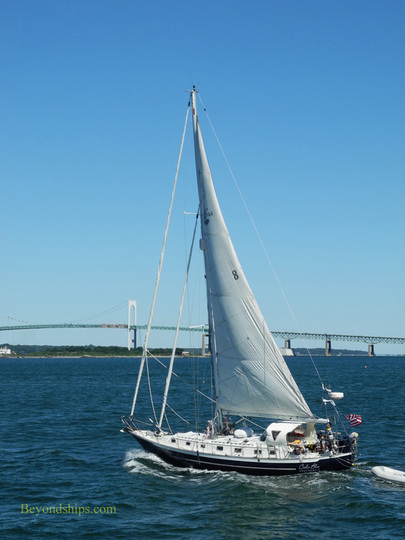 Some ships calling in Newport offer shore excursions in which passengers can sail on a 12 meter yacht similar to those that competed in the America's Cup races. 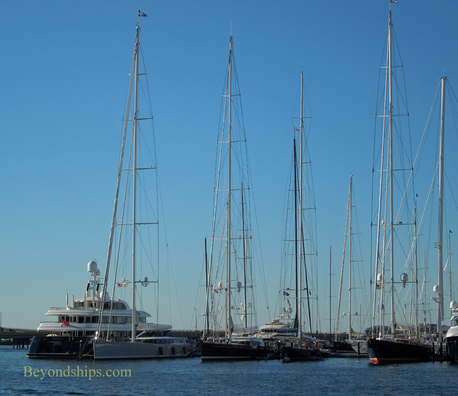 There are also independent providers who offer excursions on the water either in sailboats or power ships. For those interested in learning about yachts and the history of yachting, there is the Museum of Yachting at Fort Adams. 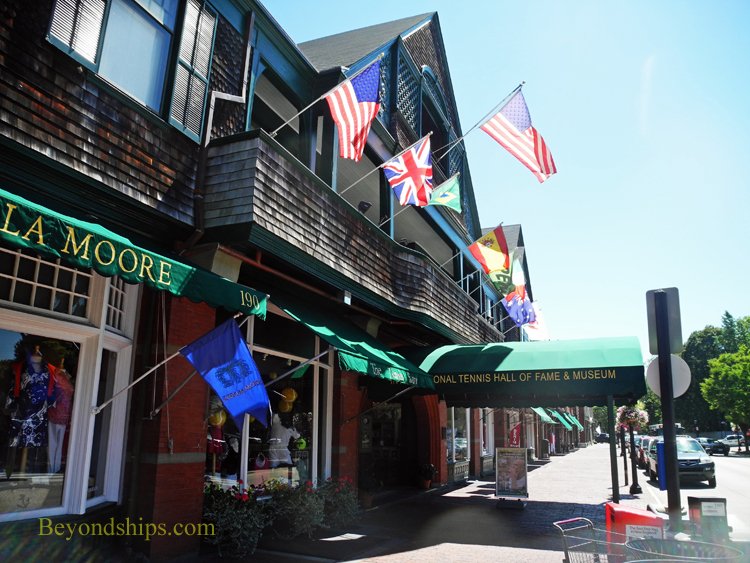 In addition, in nearby Bristol, there is the Herreshoff Marine Museum and America's Cup Hall of Fame. Newport has many other attractions. 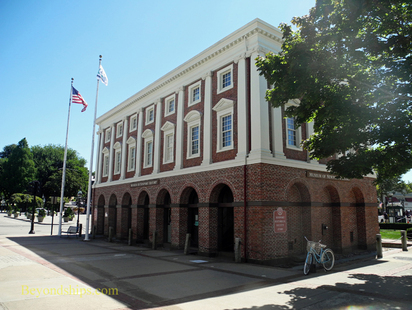 For example, The Redwood Library, 1747, the oldest lending library in the U.S. There are also a number of beaches in the Newport area. Several including Easton's Beach, Sachuest Beach, and Gooseberry Beach, are open to the public. Others, such as Baily's Beach and Hazard's Beach, are private.